The iPhone 6 and iPhone 6 Plus gained a feature called Reachability which, when activated, brings all onscreen icons and elements closer to the bottom of the display and Home button, thus making it easier for your thumb or finger to reach the desired touch points. While Reachability is proving to be a popular tool for many larger screen iPhone owners, some other users are discovering that they’re accidentally enabling the feature when they don’t want to. If you find yourself accidentally sending your iPhone into Reachability mode and smushing down the screen and icons, you can choose to disable the Reachability function entirely. Just keep in mind that it’s all or nothing, so if you sometimes use the feature, turning it off is not really an option, this is really best for users who accidentally wind up in Reachability mode and never intentionally use it. Reachability will no longer activate as usual with the double-tap. With this turned off, you can double-touch the Home button all you want and Reachability will never activate, and neither will anything else, there’s simply no response at all from iOS. At the moment, there’s no customization offered or any other alternative action for double-touching the Home button, so it’s either have Reachability enabled, or have it turned off completely. That may change in a future version of iOS, however, and ideally there would be alternative actions to subscribe to the Home button light-touch, and perhaps an ability to change the amount of taps required to summon Reachability in the first place. Of course, if you decide you liked the feature, just flip that same settings switch back ON again and you’ll be able to double-tap the Home button to access Reachability again on your iPhone. so you’ve written a posting saying “if you accidentally turn on a feature you don’t want, solve the problem by turning it off”? Don’t give up your day job – not sure that blogging is for you! Yes, that is correct Joe. 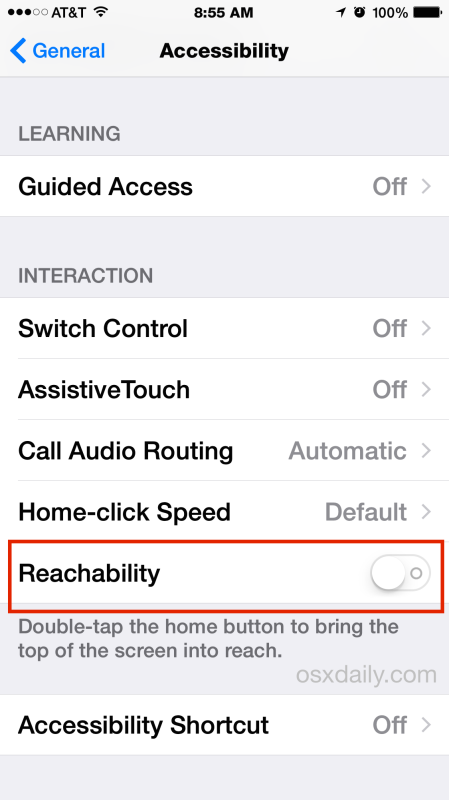 Many people accidentally turn on Reachability, so turning off Reachability will prevent that accident from happening. If you don’t use a feature and you find it to be intrusive, disabling it is often the best way to prevent the frustration from happening in the first place. That is why this article is titled “How to Disable Reachability on iPhone If You Accidentally Open It”. But if you like Reachability, and many do, then by all means, keep it enabled and use it. This is really only for users who do not use the feature and who find themselves accidentally entering into Reachability without an intention on using it. And by the way Joe, blogging is my day job and I have been doing it for years. Cheers! Joe Bloggs is a moron who secretly uses Windows. Shame on Joe for attacking hard working writers. Damn fool he is.